The Pro Plus doesn't just wake you up, but it also notifies you of incoming calls on your landline and cell phone! This system includes the Alarm Clock Pro for wake up alarms and landline phone notification, a powerful vibrating bed shaker, and the Visit Cell Phone Sensor which alerts you to calls and texts on your smartphone or tablet. 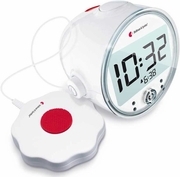 Don't worry about oversleeping with the Alarm Clock Pro from Bellman & Symfon. Using a loud alarm, flashing lights and vibrating bed shaker, the Alarm Clock Pro and Cell Phone Sensor can wake you up while sleeping or when you get a call. Perfect for any level of hearing loss! The Cell Phone Sensor is placed on top of your smartphone. It is activated when your smartphone display lights up.